As we celebrate Father’s Day, explore with me two questions: How do dads lead? And what do dads need? Back in the day – through the ’50s and ’60s – dad led by protecting and providing, establishing order and rules. In the identical 1,400 square foot ranches on the long block on which I grew up, the dads — and there were dads in every one of those houses — seemed to get it right most of the time. Oh, there were costs. Many cursed and yelled to enforce their authority; some even struck. Rules were inconsistent, sometimes reflecting their moods, biases and alcohol intake, rather than being clear and consistent. True to their times, few valued females as equals. My dad typified that old authority. I will never forget how, when I was 17 and slept through about the only Sunday Mass I ever missed, he coolly refused me the keys to his car. “You followed your values. These are my values…and my keys.” Never mind that my heartthrob from Florida was passing through that day and I couldn’t possibly reach her by public transit. Those dads bent about as much as the heavy steel bumpers on their Country Squires. They earned their authority by providing for us — often through dirty, dead-end, soul-killing jobs, where they reported to bosses who could be as heavy-handed at work as our dads were with us at home. We don’t have to romanticize dads back in the day to acknowledge the great merit in their leadership. Like many of his era, my dad risked his life for country and saved at least one soldier’s life. He was loyal to the bone: to city, country, church, company, and above all wife and family. Dads like mine gave us the sense that authority watched out for us, there were rules, and we had both responsibility and belonging. My dad made me want to be a man, to take my place, to serve my country, family, and bride. He’s been gone for 16 years, but every day I’m grateful to walk upon the purposeful foundation he laid for my life. Today’s father leadership is a very mixed bag. My dad would have found it utterly unimaginable that 40 percent of today’s American kids are born out of wedlock and one in three children is raised in a fatherless home, according to the bipartisan Committee for a White House Council on Boys and Men. What has become of us men and the society around us? Father leadership-of-old inflicted wounds, but many men today are inflicting the worst wound of all – their absence is a daily rejection. Meanwhile other new dads will make your heart soar. This past Monday, I spent a couple hours at a nearby park with San Francisco’s East Bay Dads Club. So cool to see these innovators, secure enough in their identity and manhood to leave the job track. I was inspired watching them guide their two and three year olds through lessons in sharing, patience, and fear. I thought back to the days when my own children were younger – I was almost always the only man on the playground. I was jealous to hear them talking to other men – about the A’s and Giants, home brews, and these lucky little ones who have dads at the center of their lives. I was struck by the mix of physicality and nurture; in ’50s homes we were daily at mom’s feet; in this park, kids saw the world from six feet up on dad’s shoulders. I was especially struck by one self-aware dad who shared with me how he thought he’d be a great stay-at-home parent, but due to his daily struggles to be patient, he now thinks he’s ‘just okay.’ Two generations back, nobody expected “patience” to be a big paternal virtue, let alone for a man to openly recognize his emotional shortcomings to another man. As he models such honest self- awareness, his little boy will likely grow into an emotionally intelligent child. Thus, where some men are absent, many others are choosing to be present in revolutionary and transformative ways. Many dads who go off to work each day are also embracing the new fatherhood. The title of the most recent study by the Boston College Center for Work and Families says it all: “The New Dad: Right at Home.” Like their female counterparts, they’re struggling with the added responsibility of leading at home and work; according to recent data from the Families and Work Institute, men – even more than women – feel stress about meeting the combined expectations of home and job. The truth is glaring: women aren’t the only ones who were trapped by their socialization. Looking back this Father’s Day, we’d do well to express thanks to those fathers who did their best to lead with authority, with loyalty, and with the “my house and my rules” mentality they thought would benefit us. 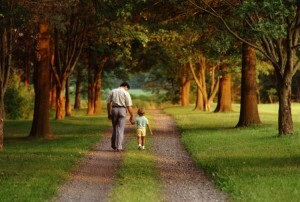 Truth is, our children suffer from the lack of structure and belonging that the good, old-fashioned father contributed. We can perhaps modernize it with a little more care and fairness. We also need something new: a society-wide commitment to discover, invent and support a new form of dad leadership. Our society seems committed to the encouragement of women and girls, and that’s working! Back in the day, men weren’t supposed to need encouragement or help. But it’s time we men acknowledge our humanity, for as dads we could use some love and support. We’d love honest curiosity about our experience. Your compassion towards our changing fatherhood experience might be the best Father’s Day gift you can offer . . . in these darned interesting times when we’re all trying to lead with our best self. 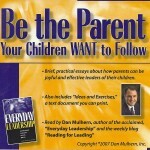 This week, receive free shipping on the inspirational audio CD for parent leaders. Dan takes the research-tested ideas that are guiding business and political leaders and applies these lessons to home. He shares surprising, powerful and practical ideas you can use to inspire, challenge and empower your children. Dan doesn’t just share great successes but also mistakes he has made that have taught him. He also shares the work of some great parent leadership writers in this 90-minute series.